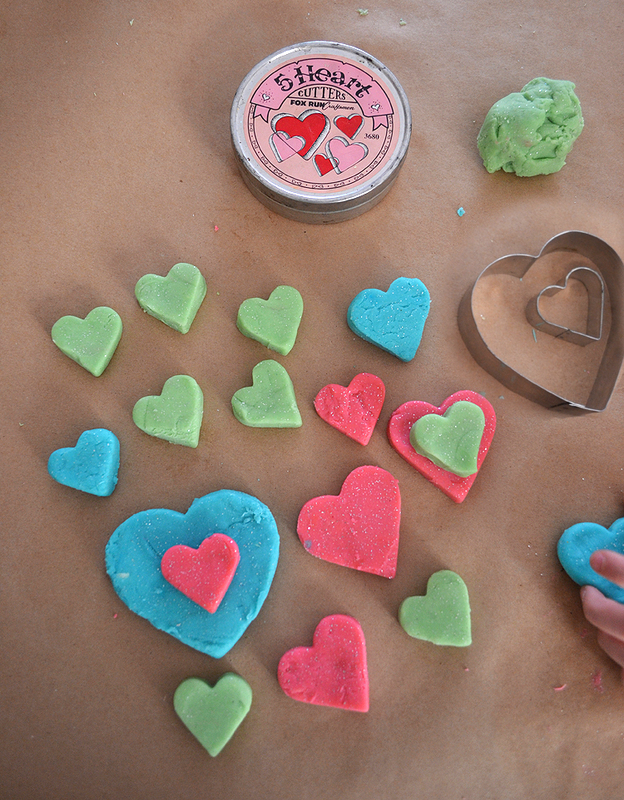 If you have never made homemade playdough, I hope this post compels you do it already. It’s really easy and cool to make. (By cool I mean sciency and awesome). The kids loooooooove making it, but the true bonus is that it lasts forever and ever! (By forever I mean in playdough-time, which is about 6 months). We used food coloring but you could also experiment with natural dyes. Mix dry ingredients in a big-ish bowl (big is good because then little people can stir without losing too much). Add the water, oil, food coloring and glitter. We used about 2 tablespoons silver glitter. When fully mixed (it’s ok if there are still a few lumps), pour into a non-stick pan over medium heat. Cook and stir for about 3 minutes, or until the mixture draws away from the pan. Cool until you are able to handle it. Knead until smooth and place in an airtight container (we use zip locks). 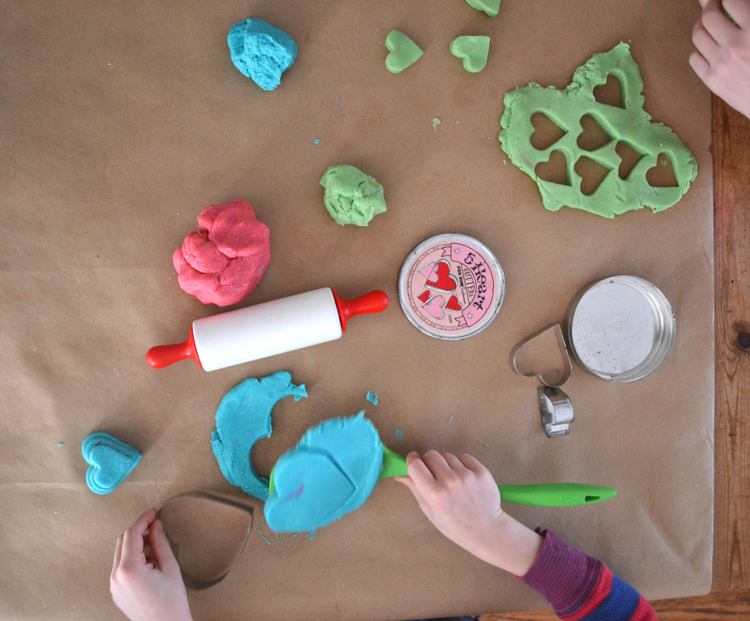 We’ve collected many tools over the years for playing with our playdough. 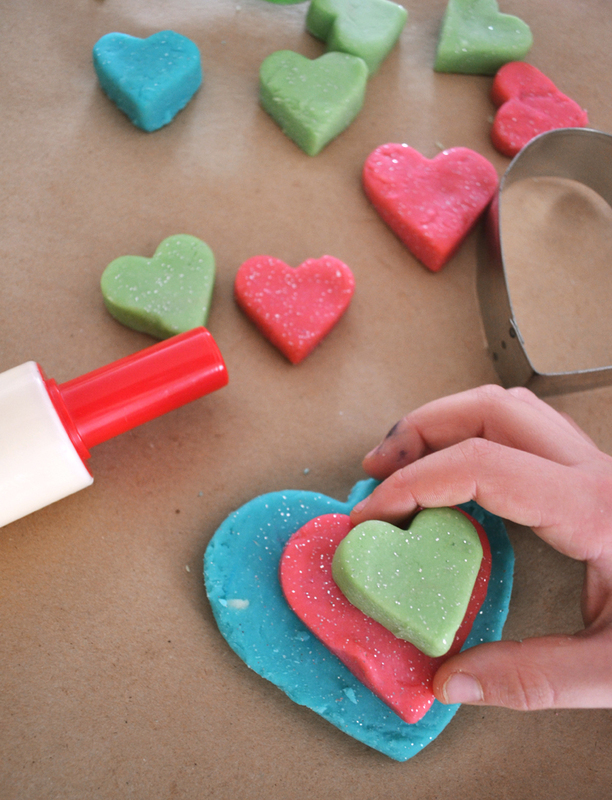 On this day, we used a roller, spatula, potato masher, and an old set of heart cookie cutters. 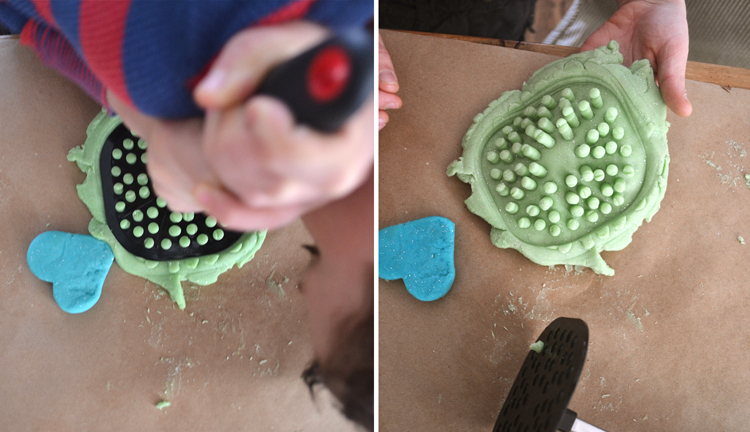 Playdough never gets boring because it’s so tactile. Even my 13-year old will knead and roll and cut. And there is something about homemade playdough that is softer and even more satisfying to squeeze! Make some today before Nemo hits (for all of you New Englanders), and stay safe!! Today is a great day for this. Thank you! 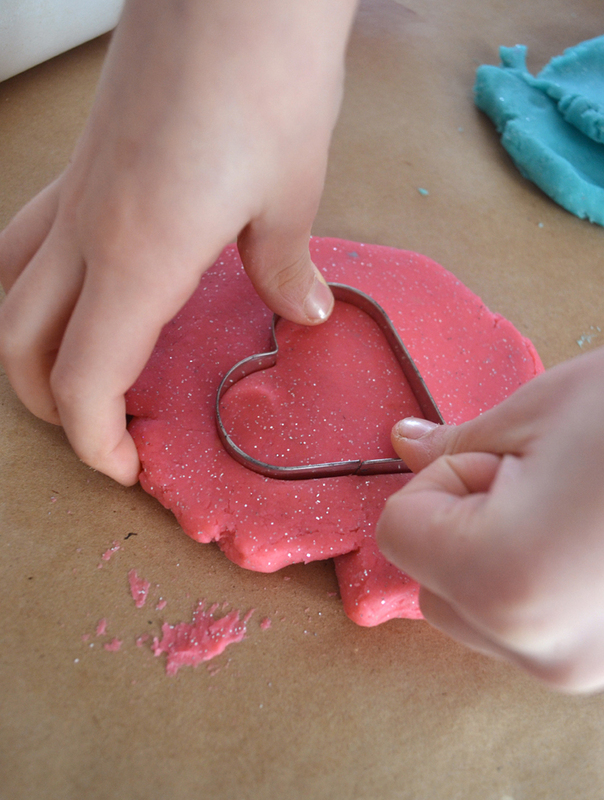 I love making play doh, the cooked version definitely lasts longer. Also try adding a few different flavourings to your different coloured play doh with strawberry essence, vanilla essence etc. adds another dimenson to the sensory play. Ooh! I love that idea…thanks for sharing! 2nd my toddler boy likes to carry the play dough in his hand..so…word of caution lol if you have suede couch the oil from the flour will leave a mark on your light furniture. Also be careful of slippery floor. Other than that it has been a biiiig hit !! Thank you. what about ants. i live in a humid Caribbean environment would the play dough attract ants? well, the play dough has a high salt content. i don’t think ants will like it, but that’s just a guess…i don’t have scientific evidence. it’s worth a try!! good luck!! I saw that you tagged our site in your recent post about homemade playdough/glitter and wanted to thank you! I appreciate the support and am so excited to have found your blog. Your photography and artistic skills are really great. Looking forward to continuing to follow! I was going to try this recipe with my class, but we don’t have access to a stove. Have you ever made it with the same ingredients but not cook it? hi Jessica, I have not made it without a stove, but there are no-cook playdough recipes out there. you can probably just Google it! I make this exact same recipe but in my large stand mixer and use boiling water. Always perfect!